2 Cycle Full Crank Power Head is rated 4.6 out of 5 by 808. Rated 1 out of 5 by RafeMem from Still looking for one that works. So, I had to buy a new powerhead due to my previous ryobi power head dying after 3 years. Was very happy with that one and literally have all the attachments minus the cultivator. First one I bought, ran off and on for several hours before it gave up the ghost and wouldn't start. Took it back, second one never started. Took it back, third one started and ran fine...as long as you had the throttle at full blast. Let off for even a second and it died every time. Took it back and bought the 4cycle, which I haven't tried yet so who knows. If I didn't have all the attachments already I'd buy a different brand. Ryobi, you need to work on your quality assurance out of the factory. Rated 5 out of 5 by svttodd from Easy to start, plenty of power, good value I bought this 2-stroke power head to replace an older Husqvarna power head that lasted for years, but had finally gummed up from bad fuel. The price of the new Ryobi Power Head was so good, that I bought it rather than try to rebuild the old Husky. 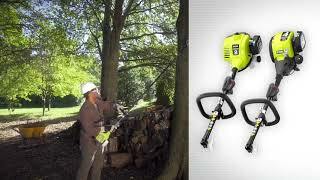 The Husky and the Ryobi both use the same quick attachments (weed eater, hedge trimmer, edger, etc). The Ryobi seems to have just a smidgen less power than the Husky (Husky has a couple more cc's of engine size), but the Ryobi still has plenty of power to spare with any of the attachments, so it doesn't really matter. The Ryobi is much lighter weight. Very easy to start. Very reasonable price/value! Great unit! Rated 5 out of 5 by Chilipepper1462 from RY251PH 25cc 2-Cycle Power Head RY251PH 25cc 2-Cycle Power Head I bought this unit a couple of weeks ago because my old Ryobi power head broke down. The unit was around 20 years old and the drive shaft wore out. The motor still starts and runs but for a few more bucks I could buy a whole new unit instead of fixing the old one. Over the years I have collected the 2 string trimmers, cultivator/tiller, edger, hedge trimmer, and blower. All in all Ryobi products have been in my garage for a long time including a whole set of 18 volt tools. I expect to get another 15-20 years out of my new power head just like the old one. Great products at reasonable prices. Rated 5 out of 5 by EES Kellows from Want tough? You just bought it!! I've used Ryobi products now for over a decade and I demand equipment which can take a pounding, yet perform like it came out of the box every time I need it; the 2 Cycle is one of the best. I've never had such a more productive multi-functional tool with the expand-it components, whether trimming, blowing leaves or pruning, you can rely on the 2 Cycle to power you through even the toughest jobs. This is my second one, no, the first one still runs fine which is now at my sisters house, but the new one has noticeable improvements from design, power, fuel efficiency and operation is apparent right out of the box. You will not be disappointed! Rated 5 out of 5 by bpm1 from Very easy to set up and use This is not the first time I have bought this brand but it is the first time is quite some time. WOW has this product been upgraded in the interim. I am very pleased and impressed at how easy it was to start using it right out of the box! Started on the 2nd pull! I highly recommend this unit. It takes all my previously purchased attachments. NOTE: I am now convinced that my fist purchase many years ago of a Ryobi weed trimmer that died way too soon was the result of the ethanol added to gasoline. I recommend that only ethanol free gasoline be used or if not available anywhere use the additive products to neutralize the ethanol effect! Rated 5 out of 5 by friscofordguy from Replacement for Crapsman This Ryobi RY251PH powerhead is a replacement for a Limited Edition Craftsman 25cc powerhead. The craftsman was "limited" alright! Limited to a 2-year life span before the carb gave up, even while using canned, premixed fuel. Used the Ryobi for the first time today and it matched up great with the string trimmer and edger tools that I already had. The motor is plenty powerful to get the edger through some thick edge growth at the sidewalk while being much more quiet than the unit it is replacing. Glad I could find the stand alone Ryobi powerhead unit at Home Depot and I'm pleased with the value! Rated 3 out of 5 by Rob2149 from Works Well For A While, But Not Durable This is my second Roybi 2-stoke Power Head. It works well and is a reliable starter, but it is cheaply made, flimsy and will not last. I had the bolt holding the exhaust manifold shear off, I had the rope pull starter fail to return, I had the plastic case break in various areas, but I did get three years of use before it quit running altogether. So why did I buy another you ask? Two reasons: 1) I have several Expand-it attachments and, 2) A new Toro power head is $129 and a new Stihl power head is $199 while a new Ryobi power head is only $79. I can buy two or three Ryobi power heads for the cost of one Toro or Stihl! That said, Ryobi does need to refine this product so is more durable. Introducing the Ryobi 2-Cycle Gas Power Head with a full crank engine for 2X longer life and a Zip Start carburetor for easier starting. This power head accepts Ryobi Expand-It Universal Brand Fit attachments adding versatility to your unit. Simply attach an edger, a blower, or even a hedge trimmer to the power head and quickly move from project to project. 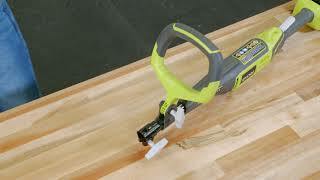 Save time, save space, and save money with the Ryobi Expand-It System. 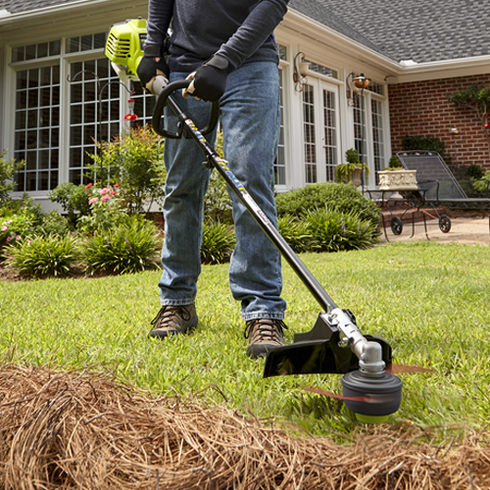 Backed by a 3 year warranty, trust the Ryobi 2-Cycle Gas Power Head for any of your outdoor projects. 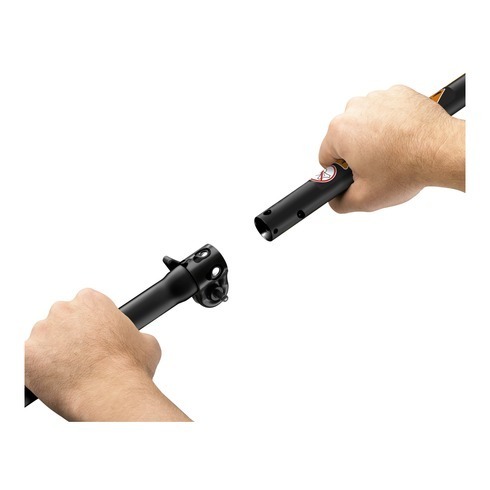 How should I store my 2 Cycle Gas String Trimmer? 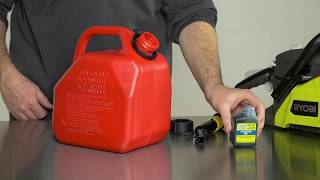 What is the correct fuel mixture to use with my 2 cycle engine RYOBI Outdoor Product? 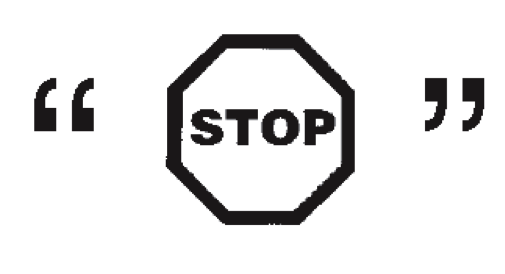 Your 2-cycle engine requires pre-mixing gasoline and 2-cycle lubricant. Pre-mix unleaded gasoline and 2-cycle engine lubricant in a clean gas container. DO NOT mix quantities larger than usable in a 30-day period. Do not use automotive lubricant or 2-cycle outboard lubricant. We recommend using a RYOBI/Homelite premium 2-cycle oil or a PowerCare 2-cycle oil. Loosen fuel cap slowly. Rest the cap on a clean surface. Carefully pour fuel into the tank. Avoid spillage. Prior to replacing the fuel cap, clean around the gasket. Note: it is normal for smoke to be emitted from a new engine after fist use. How do I start my RYOBI 2 Cycle String Trimmer? Slowly press the primer bulb 10 times. Set the choke lever to the START (A) position. Squeeze the throttle trigger fully and pull the starter handle until the engine runs. Do not pull the start grim more than six (6) times. NOTE: Keep the throttle trigger squeezed fully through remaining steps. If the engine does not start, start over at the first step with pressing the primer bulb. Allow the engine to run for 10 second, then set the choke lever to the RUN (B) position. Set the choke lever to the RUN (B) position. Squeeze the throttle trigger fully and pull the starter handle until the engine runs. How do I stop my RYOBI Gas String Trimmer?